Although Doulton Lambeth boasted many talented designers, there is one that invariably springs to mind when it comes to impressive imaginative sculpture. George Tinworth had an ability to turn his hand from humorous comical mice (click for more on the Tinworth mice) through to impressive biblical scenes. A skilled sculptor, designer and artist, today Tinworth’s work can fetch thousands of pounds at auction making him one of the most respected artists from the Doulton Lambeth factory and giving him a reputation for being one of the most skilled designers of his time. 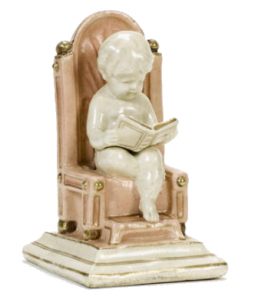 Pictured left: A Rare Stoneware Figure of a Seated Boy modelled seated on a high back chair reading a music book on stepped base, in cream and pale pink glaze, heightened with gilt 10.5cm high, impressed artists monogram and factory marks. Sold for £3,120 at Bonhams, London, 2007. Image Copyright Bonhams. Born into pure poverty on 5th November 1843 at 6 Milk Street, Walworth Common, South London, George was to be the only son out of four who survived past his infant years. His father worked as a wheelwright and although George had taken many jobs at a young age in order to earn a crust, by the age of 16 he began working for his father. It was whilst helping with the wheelwright trade that he started to experiment with his love for drawing and carving, as he would secretly use his father’s tools to practice carving in wood. Tinworth’s mother was aware of her son’s passion and encouraged him to develop his skills, so at the age of 19 he decided to attend the Lambeth School of Art. Pawning his overcoat in order to finance his fees Tinworth became a talented potter and modeller, and this was recognised by the head master John Sparkes, a man who was to become an anchor at the start of Tinworth’s career. After completing three years at the Lambeth School, Tinworth was offered an opportunity to study full time at the Royal Academy. However, this meant that he needed to gain the permission of his father. At first reluctant, his father finally did agree as long as his son still worked for him before and after school days. 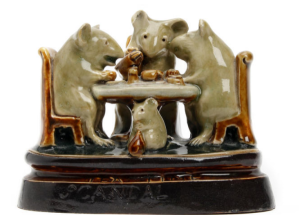 Pictured right: A rare George Tinworth Doulton Lambeth stoneware mouse group ‘Tea Time Scandal’ Modelled as three mice seated at a table drinking tea and gossiping, whilst a young mouse sits underneath the table, glazed in green and highlighted with ochre and treacle glazed detailing, the base inscribed ‘Tea Time Scandal’. Sold for £2,625 at Bonhams, London, 2012. Image Copyright Bonhams. By the time Tinworth had finished his studying in 1866 he had exhibited many of his works at the Royal Academy and won a number of acclaimed medals but sadly his father had passed away, so it was now Tinworth’s responsibility to support his mother. The obvious solution was to return to the wheelwright trade. Around the same time, Doulton – the family business which produced industrial ceramics such as bathroom fittings and drainage pipes – had decided to diversify their wares by creating decorative art pottery. Henry Doulton, the son of John Doulton was helping his father by working closely with the Lambeth School and its headmaster, John Sparkes. Aware that Tinworth had returned to his former trade, Sparkes was worried that Tinworth’s talent was being wasted so introduced him to Henry Doulton. The inevitable happened and Tinworth was offered a job at the pottery works where he started by decorating their wares. This however, did not last for long as his talent for modelling was soon discovered. Tinworth had an interest for biblical scenes as his mother had brought him up to study the scriptures, and so used this knowledge to produce impressive sculptured biblical works. One of his greatest was the large scale terracotta fountain entitled “Fountain of Life” which was donated by Henry Doulton to Kennington Park. Although collectors are fascinated by his Biblical sculptures it is the smaller works that are collected, especially the “Humoresques” which were first introduced in the 18705. These comical sculptures of animals in human situations were Tinworth’s way of finding light relief in his work and very few were actually produced, which is why they are so eagerly sought after today. Tinworth’s most popular subject matter for these designs is small mice; which were singularly created as paperweights or in groups to portray a humorous story. 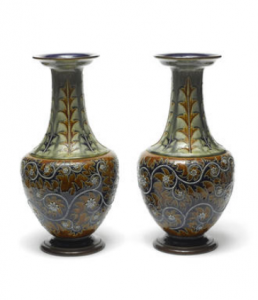 Pictured left: George Tinworth for Doulton Lambeth A Large Pair of Stoneware Vases, circa 1895 the footed bulbous bodies with flared necks, painted with scrolling beaded design in blue, white, brown and greens 54cm and 55cm high. Sold for £2,400 at Bonhams, London, 2007. Image Copyright Bonhams. “Play Goers”, featuring a family of mice watching if a Punch and Judyshow whilst having music played to them by a one-mouse band, sold at Bonhams for £4,200. Other pieces to recently come up for sale were a pair of stoneware mice candlesticks entitled “Gardener” and “Florist” which again were snapped up by collectors and a comical piece entitled “Cockneys at Brighton” featuring a group of mice in a rowing boat. Although Tinworth’s “Humoresques” were unique works of fun, thus acting as a break from his more serious designs, he also produced many other smaller decorative and figural wares, proving that he could turn his hand to anything. Tinworth’s stoneware figures of children playing musical instruments have becoming harder to find and usually fetch a few thousand pounds, whilst some of his decorative vases can be more affordable for collectors. Easily recognisable by its decoration, Doulton Lambeth ware varies in price depending on whether it has a maker’s mark, who the maker is and how unusual the piece is in shape. Tinworthdesigned pieces can be picked up at both spectrums of the affordability ladder. A stoneware vase in ovoid form recently sold at Bonhams auction for £250 whilst a lemonade set achieved £1,000. Tinworth was one of the main designers responsible for the success of the Doulton Lambeth factory in London and was to remain at the factory throughout his working career. A skilled and talented sculptor, his work had gained great public attention. By 1894 Tinworth is said to have created almost 500 terracotta panels all depicting biblical scenes (many of which can be found in Cathedrals around the country, with York Minster having some of his most notable works). He also created vast amounts of smaller wares which included tankards, vases, plaques and busts. This prolific potter’s formidable talent for taking any shape, subject matter or scale and transforming it into an impressive feat of artistry – proves that Tinworth was by far one of our most celebrated designers. His work is just as highly regarded now as it was back in the late 19th Century.